I had some fun with Smoke photography this week. I borrowed a King Cobra from the antique shop, (it’s amazing where you can get dangerous animals these days) and I bought a pack of incense sticks that actually smelled really nice. I had an idea that was fairly spooky, pre Halloween - esque. 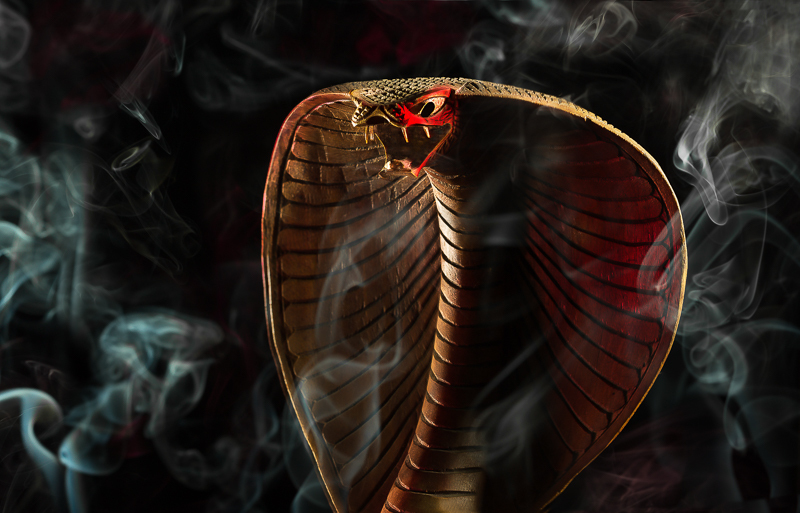 An angry, ready to strike snake surrounded by smoke, giving the image a hellish aura, where the Cobra has a mysterious (yet oh so endearing) stare. I will take you through my shooting process and lighting process for the Smoke & Snake photograph. If you would like a more traditional smoke photography lesson you can find a great article here and a superb video here. Two 100ws studio strobes with 18cm reflectors with 12 degree honeycomb grid spots mounted on light stands. One strobe on camera left lighting the bottom half of the snake. The other strobe, camera right, lighting the right side of the snake’s face. A third strobe, camera left, with a 21cm reflector and a mounted 10 degree grid spot, behind and to the left of the Cobra, lighting the smoke coming from the incense sticks behind. Each strobe is approximately on at half power. I also use a white bounce card underneath the cobra, to fill in the shadows on the snake. The Wooden Cobra is mounted on top of a cardboard box, on a black surface that rests on my shooting surface (a pair of sturdy saw horses and a wooden board). Underneath the box, in front, are two incense sticks that are approx 20cm apart from each other. There are also two incense sticks behind the box, in the same position. I find that incense stick are the easiest and least expensive tool for smoke photography. As I take each shot, with a wireless shutter release, I hold a light red gel in front of the strobes, moving to each of them consecutively, to add colour to the smoke and the King Cobra. I shoot tethered to the computer with the camera at f/11, which is a good aperture to capture the smoke and the snake, with reasonable depth of field. (Focussing on the face of the snake, through the smoke, was most important to me). After I took an initial shot of the snake without the smoke, I did not change my focus for the smoke, as I knew that there would be enough smoke wafting around the snake composition which I was already focussing on. The modelling lights from the strobes were lighting the smoke for me in between shots. After the shoot I selected the best smoke shots in Lightroom that I wanted to work with and I edited them in Photoshop. I first composited the shots together using layer masks, and then did some minor retouching to the Cobra’s face. I made some slight Hue/Saturation adjustments to get the ‘feel’ that I wanted. I then used a Curves adjustment layer to make the image pop, creating the right amount of contrast and finally did some sharpening with the High Pass Filter. You can create some stunning images with Smoke Photography. It really is lots of fun, not at all difficult to set up and to do, and the creativity you can unleash is only limited by your imagination. Obviously being sensible, you would want to match the smoke to the subject. Smoke coming out of a chest of drawers, perfume or shoes probably would not work.